I heard on one of my favorite podcasts yesterday that, due to the unusually cool summer we've had, tomatoes will be in season in California til Thanksgiving. Hallelujah! If you're not lucky enough to live here in the land o' plentiful produce, perhaps the last of summer's tomatoes have hung around long enough for you to celebrate fall with one last summery dish. Might I recommend this Heirloom Tomato Risotto with Fresh Mozzarella? This is one of those instant classics that I know will be a staple forever. I'm not just saying that because tomatoes and rice are 2 of my very favorite foods. This is the kind of dish I'd serve if I wanted to impress my dinner company. This recipe uses a technique that I find pure genius: the tomatoes are cooked down with olive oil and garlic until they've released their juices. Then the tomatoey juice is used in addition to the chicken stock as a cooking liquid for the rice. Brilliant, right? I don't need to convince you that tomatoes, basil, and mozzarella go well together; that's obvious. But in this particular formulation, they shine. Really, really brightly. 1. Pour the stock into a 2-quart saucepan and keep it hot over low heat. 2. Heat 2 tablespoons of extra-virgin olive oil in a wide skillet over medium heat. Add 2 cloves minced garlic, and shake the pan until the garlic is slightly browned. Slide in chopped tomatoes and stir gently until they are juicy. Toss in a handful of shredded basil, remove the pan from the heat, and set aside. 3. Heat the remaining 3 tablespoons of olive oil n a 3 to 4-quart braising pan over medium heat. Stir in the onion and cook, stirring occasionally, until softened, about 4 minutes. Stir in the leek and white parts of the scallions and cook, stirring, until the onion is golden, about 6 minutes. Adjust the heat under the pan as the onion browns so that it cooks slowly with gentle bubbling. 4. Stir in the rice and continue stirring until the grains are coated with oil and "toasted" - the edges become translucent - 1 to 2 minutes. Pour in the wine and let it boil, stirring the rice, until evaporated. 5. Season the rice lightly with salt and ladle enough of the stock into the pan to barely cover the rice. Bring to a boil, then lower the heat so the stock is at a lively simmer. Cook, stirring constantly, until all the stock has been absorbed and you can see the bottom of the pan when you stir. Continue cooking, pouring in the remaining stock in small batches. Each addition should be just enough to completely moisten the rice. 6. After about half the stock has been added, take a break from adding stock and add the tomatoes with their juices a ladleful at a time, stirring until absorbed just like you have been doing with the stock. Continue until all of the tomato mixture has been incorporated. 7. Proceed with the remaining stock. The amount of stock you need may vary, so taste to look for doneness and seasoning towards the end. 8. Remove the pan from the heat. Stir in butter, mozzarella cubes, and half of the parmesan until completely melted. Add salt and pepper if necessary. Spoon into dishes and top each serving with some of the remaining parmesan. Yum! Cooking down the tomatoes is brilliant and sounds so flavorful. Oh you are so lucky to still have tomatoes! I'm so jealous. 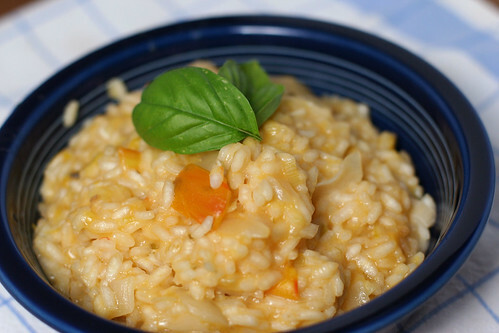 The risotto looks fabulous and full of flavor! This looks beautiful! Tomato risotto would be perfect to preserve a little summer in the Boston area, where nights are starting to cool down a bit.